The last 30 years have seen a revived interest in Henry of Ghent, one of the leading theologians at the University of Paris in the last quarter of the 13th century. 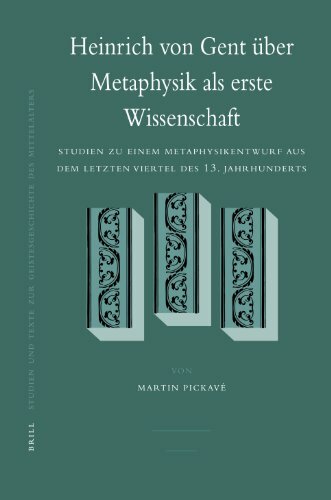 This volume offers a new and comprehensive study of a central aspect of Henry's philosophical thought: his understanding of metaphysics. The study examines why, according to Henry, there has to be a science investigating being qua being and how such an inquiry is at all possible. In Henry's conception, metaphysics is not just one scientific discipline among others but the first and fundamental one for it deals with the first object of the intellect as its subject-matter. The recognition of this understanding, as the present study intends to show, opens a new perspective on the proper philosophical dimension of Henry of Ghent's thought. Martin Pickave, Ph.D. (2003) in Philosophy, University of Cologne, is Assistant Professor of Philosophy and Medieval Studies at the University of Toronto.